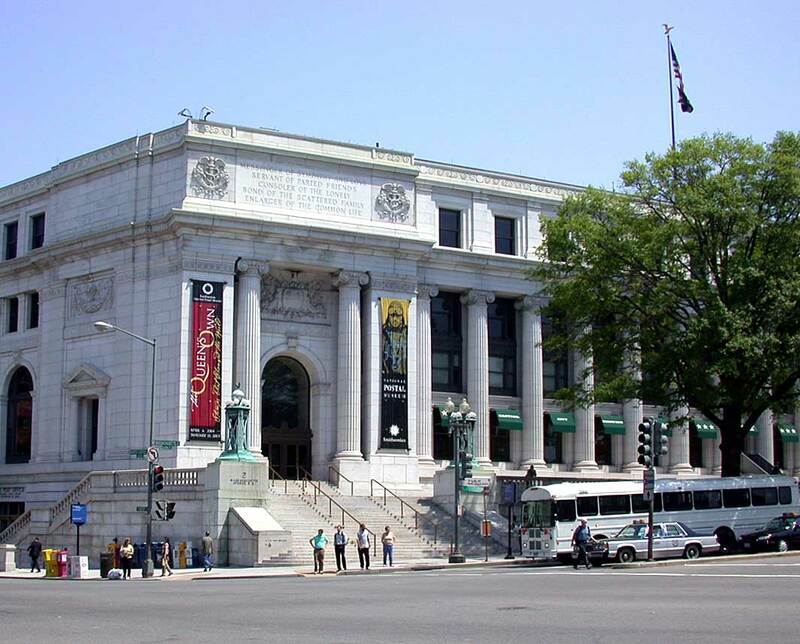 The Smithsonian’s National Postal Museum is dedicated to the preservation, study and presentation of postal history and philately. (Note: Philately is the collection and study of postage stamps, postmarks and stamped envelopes.) The museum uses exhibits, educational public programs and research to showcase the largest and most comprehensive collection of stamps and philatelic material in the world—including postal stationery, vehicles used to transport the mail, mailboxes, meters, cards and letters and postal materials that predate the use of stamps—and make this rich history available to scholars, philatelists, collectors and visitors from around the world. The museum occupies more than 100,000 square feet of the historic City Post Office Building, with 35,000 square feet devoted to exhibition galleries. A U.S. Post Office stamp store, museum store and a 6,000-square-foot research library complement the exhibition halls. The National Postal Museum houses one of the largest and most significant philatelic and postal history collections in the world and one of the world’s most comprehensive library resources on philately and postal history. The National Postal Museum’s many exhibition galleries present America’s postal history from Colonial times to the present, while its collections contain prestigious U.S. and international postal issues and specialized collections, archival postal documents and 3-D objects. The museum atrium has a 90-foot-high ceiling with three vintage airmail planes suspended overhead, a reconstructed railway mail car, an 1851 stagecoach, a 1931 Ford Model A postal truck and a contemporary Long Life Vehicle postal truck. Among its permanent exhibitions are: “Binding the Nation,” “Systems at Work,” “Moving the Mail,” “Mail Call,” “Customers and Communities” and “Pony Express: Romance vs. Reality.” The museum is also home to the William H. Gross Stamp Gallery—the largest stamp gallery in the world. Visitors can walk along a Colonial post road, ride with the mail in a stagecoach, browse through a small town post office from the 1920s, receive free stamps to start a collection and more. Museum presentations bring to life the story of “Owney,” the mascot dog of the Railway Mail Service, and tell the history of U.S. mail trains. The museum’s website offers virtual exhibits, articles and information about collection objects, academic research and access to social media platforms. With more than 40,000 volumes and manuscript holdings, the National Postal Museum’s Library Research Center—a branch of Smithsonian Libraries—is among the world’s largest philatelic and postal history research facilities. The library is open to the public by appointment only. The museum offers a variety of free educational and outreach programs throughout the year for visitors of all ages. Programs encourage and enable visitors to create their own greeting cards, discover the art of letter writing, explore the hobby of stamp collecting, participate in heritage hunts and more. “Postmark,” the museum’s official e-newsletter, is published monthly. Exhibition catalogs, educational materials, museum brochures and a three-month calendar of events are published throughout the year. The National Philatelic Collection was established at the Smithsonian in 1886 with the donation of a sheet of 10-cent Confederate postage stamps. Gifts from individuals and foreign government agencies and occasional purchases have increased the collection to today’s total of nearly 6 million items. From 1908 until 1963, the collection was housed in the Smithsonian’s Arts and Industries Building on the National Mall. In 1964, the collection was relocated to the National Museum of History and Technology (now the Smithsonian’s National Museum of American History), and its scope expanded to include postal history and stamp production. The National Postal Museum was established as a separate entity Nov. 6, 1990, and its location near Union Station in Northeast Washington opened to the public in July 1993. The museum is located at the corner of First Street and Massachusetts Avenue N.E., next to the Union Station Metrorail station on the red line, and is open from 10 a.m. to 5:30 p.m. daily (closed Dec. 25). There is a wheelchair-accessible entrance on First Street. Admission is free. More information about the museum is available at www.postalmuseum.si.edu or by calling (202) 633-5555.